Download a printable PDF file of this page here. 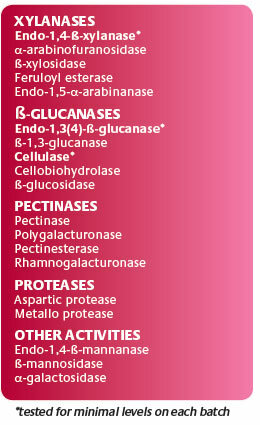 Different types of non-starch-polysaccharides (NSPs) are present in variable proportions in the cell walls of all vegetable ingredients. Monogastric animals don’t have the enzymes needed to breakdown NSPs, thus limiting the digestibility of feedstuffs. NSP enzymes act on cell walls, allowing better access to nutrients for the animal digestive enzymes, thereby decreasing intestinal viscosity and increasing digestibility of sugars. Rovabio® is the only multisynergistic enzyme containing at least five groups, all produced by Penicillium funiculosum. Rovabio® has a proven efficacy on corn DDGS thanks to its unique combination of 19 enzyme activities that work on all major ingredients. Corn DDGS are being formulated at increased levels into many diets. Corn DDGS have variable composition, but consistently have high NSP content. DDGS’s high NSP content (mainly arabinoxylans and cellulose) provides substantial substrate for the xylanase and cellulase found in Rovabio®. It is important to note that Adisseo consistently tests for cellulase and xylanase content in every single batch. The in vitro data shows that the average increase in degradability is +30%. Rovabio® always led to improved degradability because it is a combination of 19 enzyme activities. The improvement of corn DDGS energy value has been evaluated in a digestibility trial. In this DDGS sample, metabolizable energy was improved by 105 kcal/kg or 5.9%. The trial carried out by a U.S. research facility, shows that energy content of a standard broiler diet containing 12% DDGS can be reduced by 130 kcal/kg if supplemented with Rovabio® without compromising performance. In this case, Rovabio® allowed a reduction of fat inclusion by 60% on average, which realized substantial feed cost savings. Copyright © 2011 Adisseo. All rights reserved.